In the 4-4 point diagonal attachment, one-space jump (without pincer) page, it was mentioned that is usually not a good move. In this page, we discuss the case when is played at a pincer (at or around ) instead. 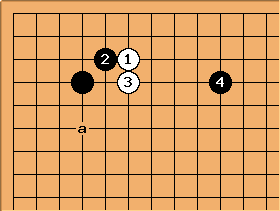 Note that this sequence by itself is usually a mistake and hence it is not a joseki. 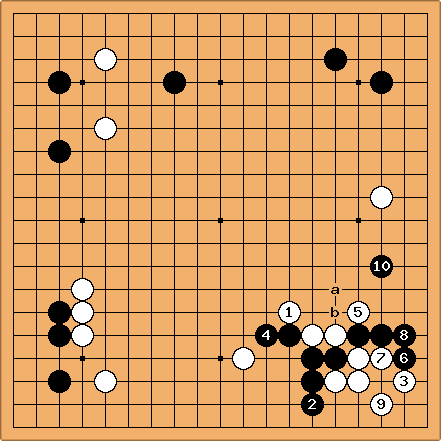 However, like many concepts in Go, there are exceptions which make this playable. One may want to compare and contrast this sequence with the 4-4 point diagonal attachment joseki. From professional play, we see that this sequence can be called a set pattern. is a good empty triangle, denying White good shape. covers his cutting point and does likewise. If here instead of in the previous diagram, White can cut and squeeze. When Black captures at a, White will protect her cutting point at b or c. This takes the fire out of the attack. This is also seen, but there is a ladder issue. White denies the good empty triangle but ends up with a mediocre shape anyway. If is played immediately, without a favourable ladder, it might be an overplay. See the Sakata-Go game in the next section. 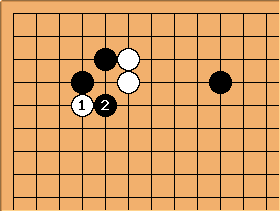 This game is from the 1st Japan's Strongest Deciding Matches played on 23 May 1957, with Sakata Eio playing White against Go Seigen. 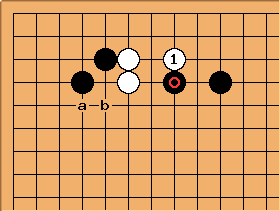 Here, the diagonal attachment against the weak Black stone at allows Sakata play in sente. 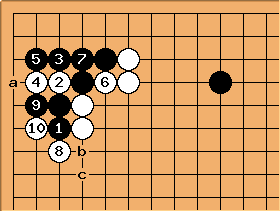 There is some number of games where White has a wall of three or more stones one space to the right of or where and were played before the touch of . Next, Sakata plays the cut of . Naturally White has the ladder. Although at a would get good shape, but Black will play at b. White lives in the corner, and Black lives on the side. In the game it was possible to exchange b for c before playing at . 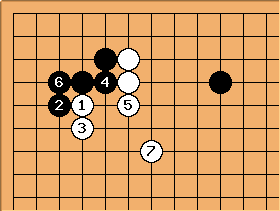 However, Black (Go Seigen) won the game. A very detailed commentary of the whole game can be found at http://www.wingsgoclub.org/books/go-seigen-book.pdf. This is sometimes seen in handicap games. Instead of playing at the usual one-space jump (see 4-4 point diagonal attachment joseki), denies White even the shortest extension. Most of the time, this is not a good idea. Without going into all the tactical complications, we can say that makes it easier for White to sacrifice and . Without that move it is difficult to throw them away. With the left side open, is quite likely to be worse than an extension down the left side. 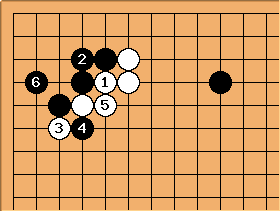 One will also need to take into account that for White to invade at , the left side is usually not open. After , at any of a to e is worth considering, particularly since White may throw and away. However, it might be that White a is indeed an overplay, inducing Black b. This has occurred in some professional games. The most common idea is this , to make some shape.